Mommy Blogger. Spectator. Advocate. Foodie. Enthusiast. All rolled into one! WHEN CONCERTS in big domes and parties in crowded urban hubs are all the rage, here comes an extraordinary concert-party experience this December. Dalampasigan Resort in Sariaya, Quezon proudly presents Wave Rave 2013, the ultimate year-end beach house concert-party! What better way to end the year than be with friends and family in an out-of-town vacation, while enjoying finest music and entertainment? Wave Rave 2013 features top-of-the-line artists including award-winning rock band Up Dharma Down and pop rock icon Yeng Constantino. Crack up with the infectious humor of stand-up comedians Super Tekla and Iyah from popular comedy bar “Laffline,” which is one of the trailblazers in Philippine stand-up comedy. And to cap the night, dance to the beat of DJ Nina, dubbed as the metro’s hottest female DJ and who’s a mainstay stunner at the top clubs and bars in Metro Manila. 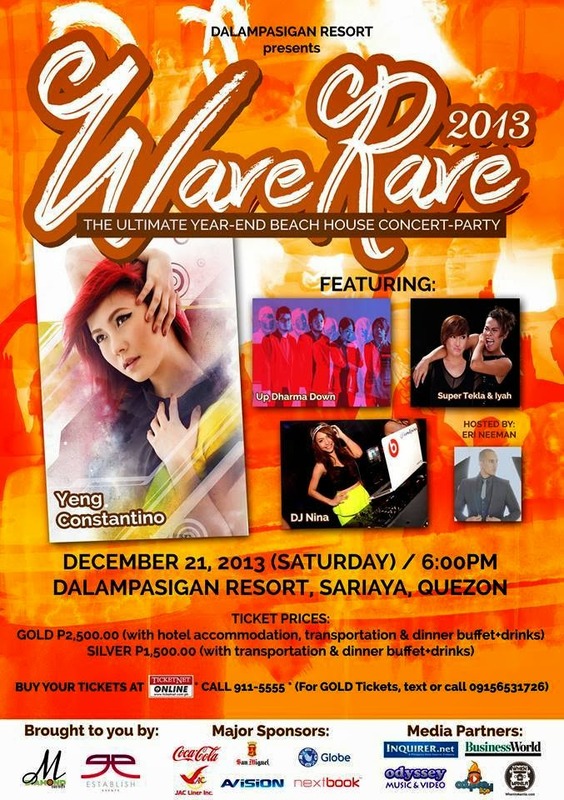 So don’t miss Wave Rave 2013 on December 21, 2013 at the Dalampasigan Resort in Sariaya, Quezon. The 30-hectare resort is one of the budding tourist destinations in Southern Luzon waiting to be rediscovered. It’s just a two-hour drive away from Manila. There will be a shuttle service for participants to and from the resort. Gold ticket holders also get free resort accommodation. Part of the proceeds of the event will go to the victims of Super Typhoon Yolanda in Visayas. Tickets go on sale Friday 22nd November, call Noreen at 0915-653-1276. Life should be a journey, full of stimulating adventures. Join me in exploring what the world has to offer. Contact me at millette.sison@gmail.com for Blog Collaborations, Product Reviews, co-marketing activities, events and Invites. Outback FREE P1,000 Gift Cheque promo of Hit A Bargain!